They are in industrial robots, smart factories and language assistants: nowadays electronic components are integrated into many products or systems with many different applications. And the trend continues unabated: in the future factories will be networked and digital, processes will be automated and systems will be intelligent. The digitalization of business and society mean specialists with interdisciplinary know-how are in high demand in the fields of mechanical and medical engineering and in the automotive and industrial electronics sectors. The Mechatronics and Digital Production programme on the Tutttlingen Campus of Furtwangen University is the answer to this demand. It combines the core engineering disciplines of mechanical and electrictrical engineering with automation technology and IT. The programme gives you the interdisciplinary knowledge you need for a promising career. In the 7-semester programme you will first concentrate on the engineering basics. In the advanced level studies you will specialize in either Mechatronics or Production focusing on questions of systems integration, industrial communications technology, digitalization and networked production. The programme gives you the best possible preparation for the challenges of the 4th industrial revolution. Graduates of the Mechatronics and Digital Production programme develop mechatronics systems, and design and implement automation solutions. They develop strategies and realize technologies for the intelligent, networked factory (smart factory). They are key players in the automation and digitalization of systems, processes, plant and machines. The demand for specialists in companies is therefore extremely high - higher than the supply. The bachelor's degree is the first step in a successful career, but you can also go on to take a master's degree either at Furtwangen University or other universities. 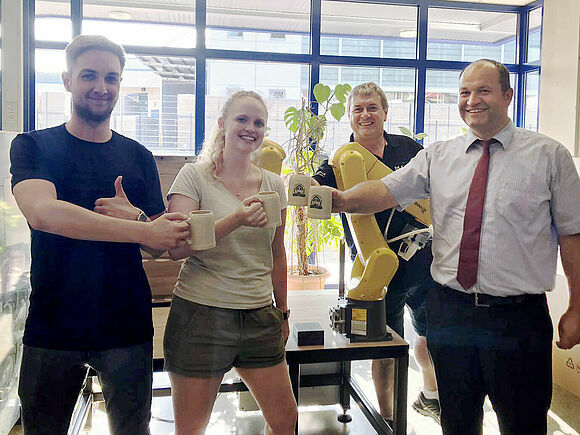 The Master of Mechatronics Systems on the University Campus in Tuttlingen would be a suitable option for you after taking your bachelor's degree in Mechatronics and Digital Production. Mechatronics and Digital Production - powered by industry! The Mechatronics and Digital Production programme at the University Campus Tuttlingen is run in close cooperation with industry. More than 100 companies belong to the Friends of University Campus Tuttlingen organization and are thus actively involved in the setting up and teaching of the programme curriculum. The course is therefore workplace relevant and highly current: company visits are carried out and student projects actually take place in the various companies. This gives students deeper insights into the field of mechatronics and production as well as the everyday work and demands of engineers working in this field.